In Australia caravans are much more common than motorhomes. The motorhomes you do see are usually B class (cab chassis) tend to be larger and heavier than many we have seen in Europe, based on the American RV style I suppose. All the bells and whistles, lots of fixed beds, and very expensive in comparison to what we paid in the UK. 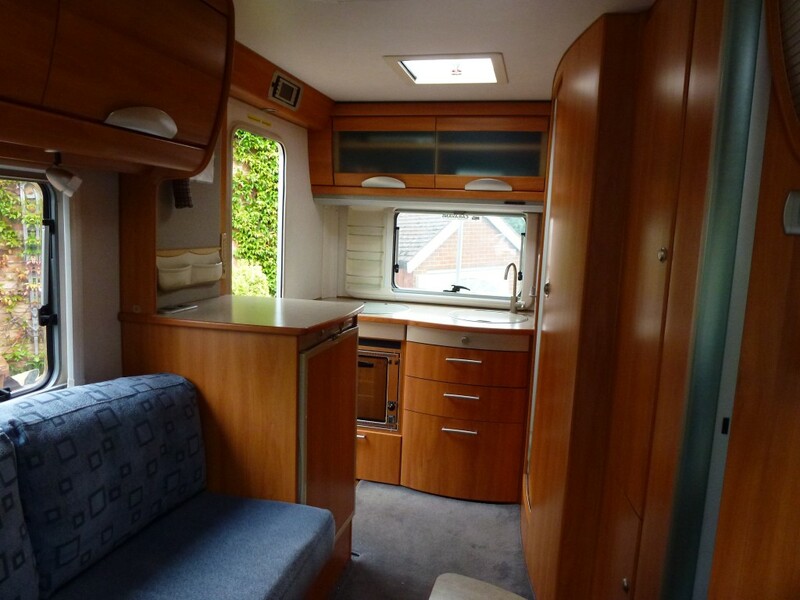 Most of our research into buying our motorhome in the UK was done by joining various on-line chat groups, as well as cruising eBay, Gumtree and the like. 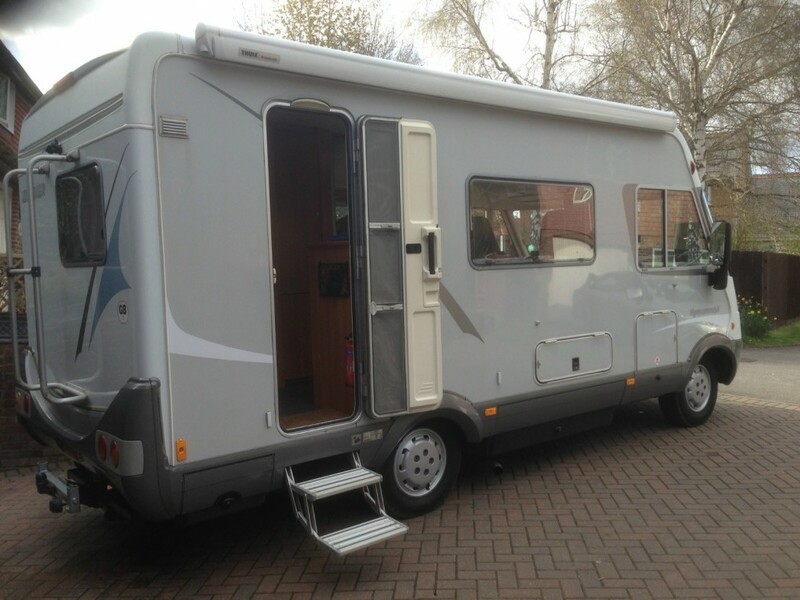 We were looking for value, accommodation for two people, separate shower, low mileage and as roomy as possible keeping under the 3.5 tonne gvw limit. Luckily we also had some family living in the UK prepared to do a little leg work (thanks Terry and Leilia). The German based Hymer vehicles ticked all the right boxes. The over cab pull down bed makes the vehicle very spacious for its size. Although it’s based on a fiat/alko chassis the body and fixture are all German built and seemed to be of a high quality. With the thought we may take it back to Australia at some point, we decided on a right hand drive. Reviewing the different derivatives under the B500 series, we liked the rear kitchen models and started looking at B584’s. 2003-2006 production models were our target, avoiding pollution restrictions associated with earlier models. Having identified a couple of likely suspects, Terry was off giving them the once over. Having done less than 25,000 miles, with everything in excellent working order, a scooter rack on the back and some hard negotiating behind us, we had our Hymer secured in undercover storage near Chichester. Our Hymer from the kitchen looking forward. 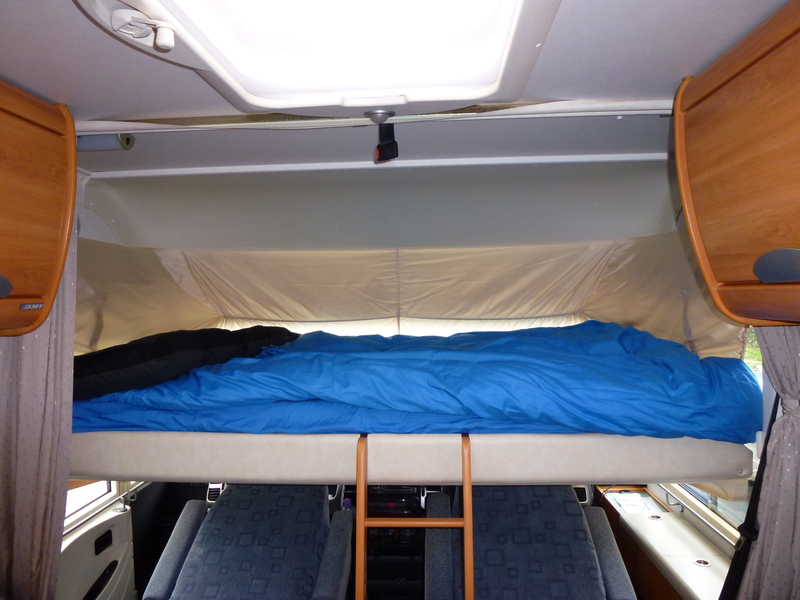 The Hymer drop down bed, a little inconvenient to get in and out off, but a great space saver and very comfortable. Arriving in the UK 2 months later we set aside a couple of weeks for getting the Hymer ready for some long term travelling and turning it into our home away from home. A Gasit refill system and a Dometic air conditioner for the habitation area being the main expenses. Setting up a motorhome on the other side of the world can be expensive. BBQ, outdoor chairs, hoses and power cables all add up. Luckily our aunties and cousins supplied lots of manchester and bits for the kitchen. Our first trip up to the midlands was a great success. The Hymer is easy to drive, has fabulous visibility, brings it own cold beer and you don’t need to be keeping an eye out for a clean toilet! After seeing the Hymer safely back in storage for the winter, we applied to have it SORN, recovered some of our road tax and headed of on a cruise and a couple of weeks in Paris but that another story. During our summer in Sydney we have had a microwave and a water filter fitted. Upgraded the leasure batteries and had the MOT and a minor service completed. Owning and maintaining a motorhome is not cheap, but the costs are comparable with owning one in Australia. After all it’s not our inheritance where spending and you can’t take it with you. A good GPS takes a lot of the anxiety out of travelling in foreign lands. 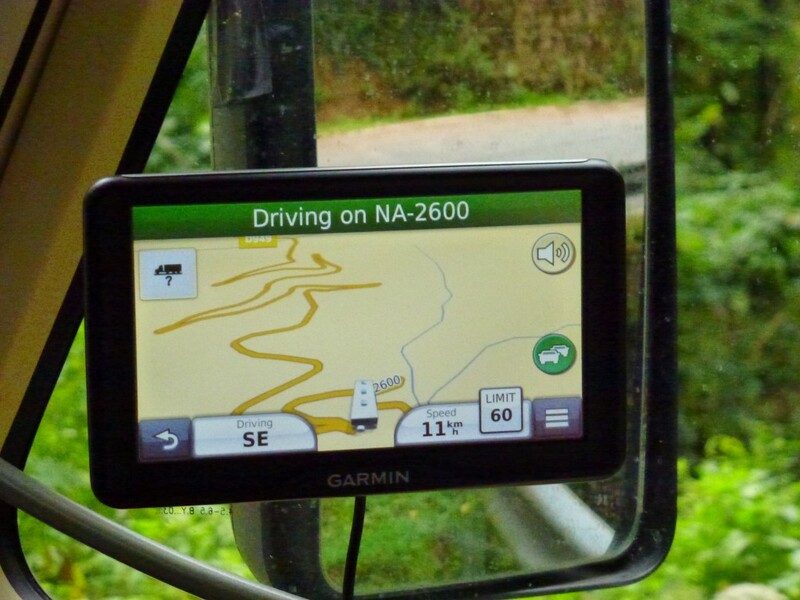 We used our old Garmin Nuvi 765 for the first two weeks of driving the Hymer and our travels in France with a rented motorhome. Despite the european map set and an update, it was very slow and froze at the most inopportune times. Heading back in 2014 we decided on an upgrade to the Garmin Dezi 760 Lmt. Its has a significantly larger touch screen, rear camera interface and the vehicle weight and dimensions can be entered to avoid low bridges and narrow streets. the Garmin POI interface has proved easy to add the various waypoints associated with camping site and services. Our other accessory added in 2014 was a Cotek SK1000 pure sine wave inverter. 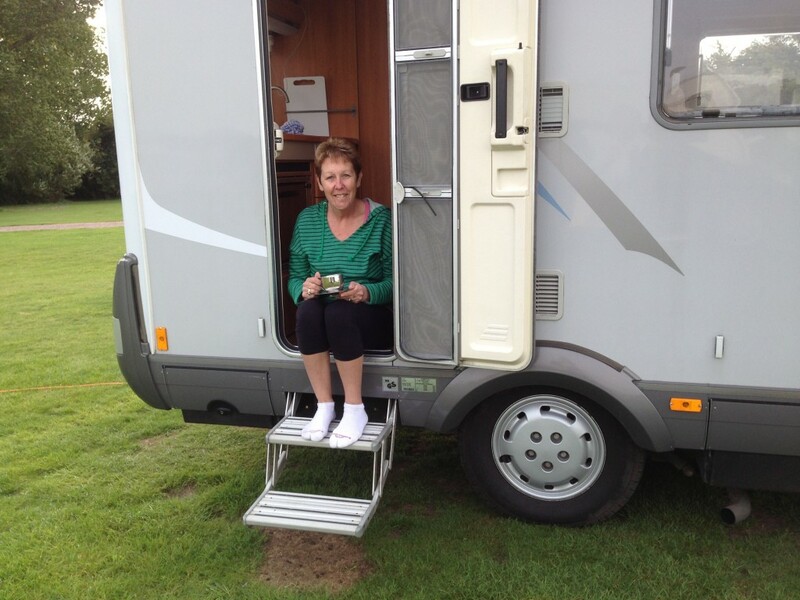 Its main purpose being to run our coffee machine whilst free camping ! I could rationalise the expense further by saying we can re-charge this or that, which we do but its primary function is coffee. During the MOT and service in 2014 the 80 amp leisure batteries both indicated a drop in voltage that had not responded to recharging. Rather than replace them with same gel batteries, we chose to 110 amp deep cycle wet cell batteries which are half the price. Having the vehicle in storage and not on charge constantly is not conducive to gel batteries in any case. The 2015 MOT and service went without a problem and I was finally able to get in contact with the previous owner who confirmed the engines timing belt was changed in 2012. So one less thing to worry about. Our other additions for 2015 are a wireless reversing camera suitable for the Garmin GPS. This proved easy to install and link, the picture quality is however average, its good enough to know when I need to ask Pam to get out and provide a guide. The other addition is a new alarm system which includes central locking. I will provide more details regarding the alarm in due course. For the 2016 season we replaced the bicycle rack which was showing it’s age with fatigue cracks getting longer. For the 2017 season we replaced the 1000 watt inverter with a Cotek SK2000. Its extra capacity allows us to run the microwave or vacuum cleaning whilst off-grid. The following link will open a spread sheet itemising the costs associated with our motorhome (other than fuel) in 2017. If you have any queries about buying, insuring, road tax, MOT or storing a motorhome as a non UK resident, send me an email and I can let you know what we did. After a lot of research in the off-season, our first stop in 2018 was Warrington and AS-Air Suspension. The Hymer has driven slightly tail low since we originally purchased it. Exasperated further by the 2 electric bikes hanging on the back. With the e-bikes sold and the purchase of a scooter pending we made the decision to fit an air-suspension kit to the rear end. An expensive addition at £1,700, but the improvement in general handling and ride have been amazing. 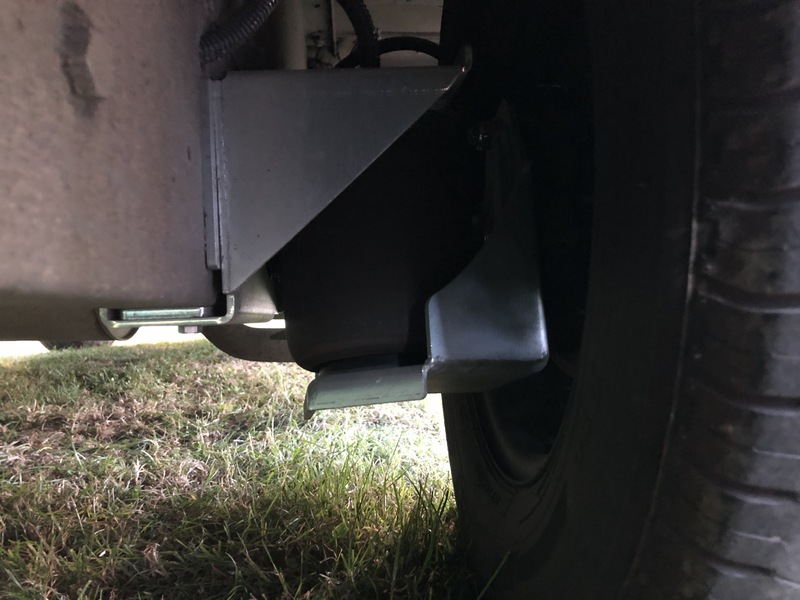 The Hymer’s rear suspension with the air-assist kit. 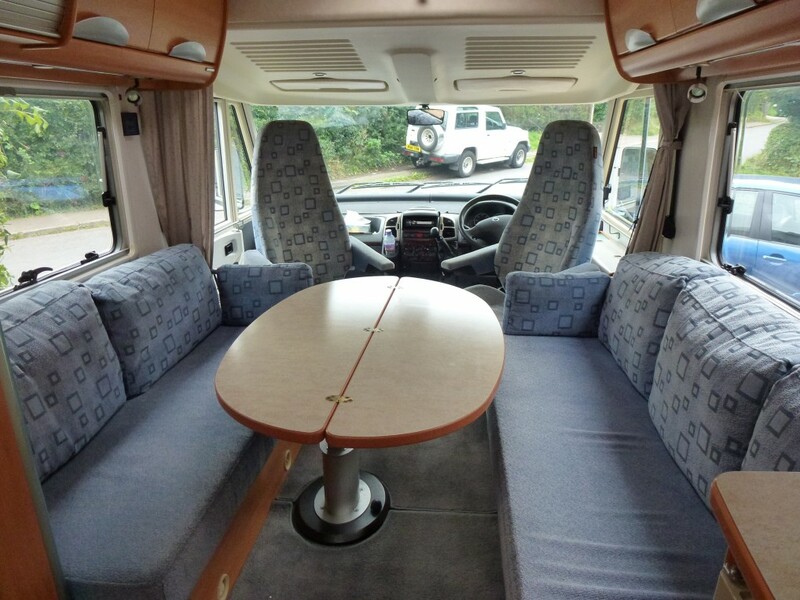 We recently met Michael and Debbie from Queensland, they purchased their motorhome through Euro Camping Cars, a French company that can provide ownership, insurance and storage of motorhomes for non-eu residents at what seems a reasonable cost. Well worth a look before you take the jump.